I cheated a bit because I'm not sure this can truly be considered a word in the English language but as I was waiting in the endless line at Brooklyn's Red Hook ballfields to order up one of these Salvadoran specialties, it struck me how funny the word was. While it sounds funny (and, frankly, not very appetizing since it has the word pupu in it! ), these savory corn cakes are absolutely delicious, especially with queso blanco and beans, served with pickled cabbage and hot sauce. Yum. 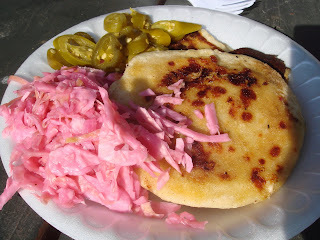 A pupusa (from Pipil pupusawa) is a thick, hand-made corn Biscuit-like flat bread (made using masa de maíz, a maize flour dough used in Latin American cuisine) that is stuffed with one or more of the following: cheese (queso) (usually a soft Salvadoran cheese called Quesillo), fried pork rind (chicharrón), squash (ayote), refried beans (frijoles refritos), or queso con loroco (loroco is a vine flower bud from Central America). There is also the pupusa revuelta with mixed ingredients, such as queso (cheese), frijoles (beans), , and chicharrón or bacon. Pupusas are similar to tortillas and especially to arepas. To completely switch gears, Saturday's funny word of the day was gonads. It's a scientific term but definitely a funny one.